The lower respiratory system: The part of the respiratory system that includes the trachea, the bronchi, the bronchioles, the lungs and the alveoli. Pharynx: The pharynx is the part of the upper respiratory tract that receives air from the nares or the mouth and then moves the air past the epiglottis to the larynx. Epiglottis: The "flap" like projection in the back of the mouth that is attached to the larynx. Larynx: It receives inspired air from the trachea and it then is the passage through which the air passes into the bronchi of the lung. 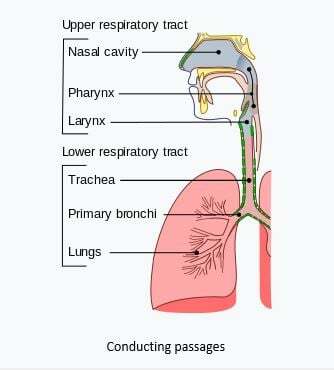 Bronchi: The part of the respiratory system that receives inspired air from the larynx and moves it into the lungs. 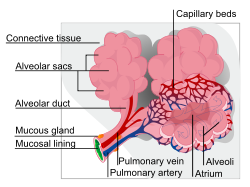 Alveoli: The air sacs in the lungs where the physiological exchange of gases such as carbon dioxide and oxygen occur. The primary role of the respiratory system is to provide the body with the necessary oxygen it requires to sustain life and to eliminate the harmful byproduct of oxygen consumption which is carbon dioxide. Other roles of the respiratory system include the filtration of environmental air to remove harmful substances from air that is inhaled and to allow speech. In order to fulfill this primary role, the respiratory system works in close concert to the cardiac system which consists of the heart muscle and the circulatory system which consists of the arteries, the arterioles, the capillaries, the venules and the veins. The circulatory and cardiac systems will be fully detailed below. The respiratory system is also in close proximity to the heart and the heart and lungs are connected to the circulatory system, as shown in the picture below. The respiratory system can be divided into the upper respiratory system, which can also be referred to as the upper airway and the upper respiratory tract, and the lower respiratory system, which can also be referred to as the lower airway and the lower respiratory tract, as shown in the picture below. 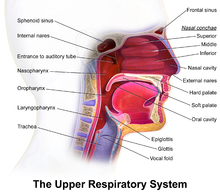 The upper respiratory tract consists of the nose and nares, also referred to as the nostrils, the pharynx, and the larynx; and the upper respiratory tract consists of the trachea, the bronchi, the lungs and the alveoli. Air, including the oxygen in environmental air, enters the body through the nares and sometimes through the mouth when the person is a "mouth breather". The nose and the nares, with their tiny hair like structures called cilia, filter environmental air to free it of bacteria and other harmful substances such as dust and air pollution. As air moves through the nose, it is also warmed before it moves along to the pharynx and the other anatomical structures of the upper and lower respiratory system. Nose or mouth > pharynx > larynx > trachea > the right or left bronchi of the lung > bronchioles of the lungs > alveoli of the lungs. The human body has two lungs which are the right lung and the left lung. 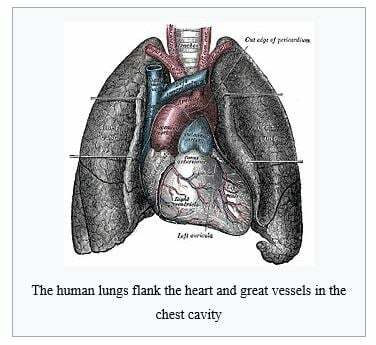 The lungs share space in the thoracic, or chest cavity, of the human body with the heart which lies between the left and right lungs, as shown in the picture above, and above the diaphragm which is the major breathing muscle of the body and at the level of the first rib of the body. Like the heart, the lungs are protected with boney structures like the ribs and the spine. The left lung lies on the left side of the heart and the chest cavity; and the right lung lies on the right side of the heart and the chest cavity. The right lung is larger than the left lung because the left lung shares and occupies the left side of the chest cavity along with the largest part of the heart. The smaller left lung has two lobes and the larger right lung has three lobes. The two lobes of the left lung are the upper lobe and the lower lobe; and the three lobes of the right lung are the upper lobe, the middle lobe and the lower lobe. The pharynx is a part of the respiratory system and also a part of the gastrointestinal system. The pharynx receives air from the nares or the mouth and it also receives food from the mouth. When people say that their "food has gone down the wrong pipe", they are experiencing an abnormal small amount of food moving from the pharynx into the tracheal wind pipe without the help of the epiglottis which, under normal situations, closes off the trachea from food and fluids. The nasopharynx, oropharynx and laryngopharynx are labeled at right. The epiglottis is the "flap" like projection in the back of the mouth that is attached to the larynx. It goes up during breathing to allow the air to enter into the trachea and it moves down during the swallowing of food and drinking fluids to allow the food to enter the esophagus which is part of the gastrointestinal and digestive system. This part of the respiratory and digestive system it also plays a role in the gag and cough reflexes. 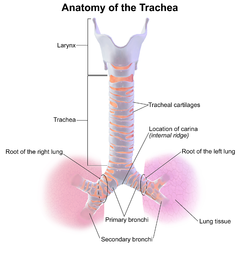 The trachea, sometimes referred to as the wind pipe connects the pharynx to the larynx. The larynx, which is sometimes referred to as the "Adam's apple and the "voice box", receives inspired air from the trachea and it then is the passage through which the air passes into the bronchi of the lung. 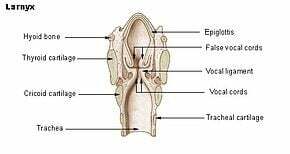 As shown in the picture above, the larynx houses the vocal cords which are necessary to produce sounds and speech. Speech occurs because the vocal cords vibrate with speech as exhaled air passes over the vocal cords. The bronchus, with the pleural of bronchi, is the part of the respiratory system that receives inspired air from the larynx into the lungs. The left and right bronchi are the entry gates of external, environmental air into the lungs. The right bronchus enters the right lung and the left bronchus enters the left lung. The right bronchus is shorter, wider in terms of its inner diameter and straighter anatomically in the body than the left bronchus. Before entering the lung, the right bronchus subdivides into three smaller branches, one for each of the three lobes of the right lung, which are the superior lobe, the middle lobe and the inferior lobe of the right lung. The left bronchus enters the right lung. The left bronchus is longer, more narrow in terms of its inner diameter and more slanted anatomically in the body than the right bronchus Before entering the lung, the left bronchus subdivides into the two smaller branches that enter into each of the two lobes of the left lung which are the superior lobe and the inferior lobe of that lung. The bronchioles, the smaller portion and branches of the bronchi, connect the bronchi to the alveoli which is the area where the physiological exchange of gases such as carbon dioxide and oxygen occur. A lobule of the lung showing r. b respiratory bronchiole; al. 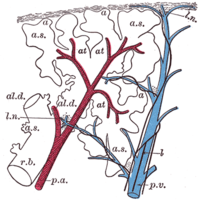 d alveolar duct; a. s alveolar sac; 'a' alveolus. The alveoli, also referred to as "air sacs", are the anatomical structures that enable and facilitate the exchange of gases in the lungs. The movement of oxygen into the human body from the inspired environmental air occurs in the alveoli of the lung; and the movement of the waste product of carbon dioxide from the human body back into the environment begins in the alveoli of the lung. This movement of gases occurs when the body's blood, with its oxygen and carbon dioxide, passes to the alveolus, which is the singular form of the pleural form of alveoli. These grape like structures expand and contract with inspiration and expiration. The respiratory cycle includes two phases which are an inspiration, or the inhaling, of environmental air which includes oxygen; and the expiration, or exhalation, of carbon dioxide. Each inspiration plus one expiration is one breath. The lungs expand and contract with each breath. The lungs expand with inspiration and the lungs deflate and relax during expiration. 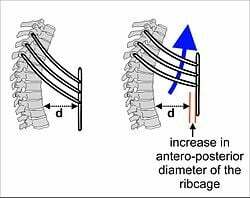 The expansion of the lungs during inspiration is possible because the muscular diaphragm and the muscles between the ribs, which are referred to as the intercostal muscles, actively allow the chest and the lungs to expand when a person breathes in. 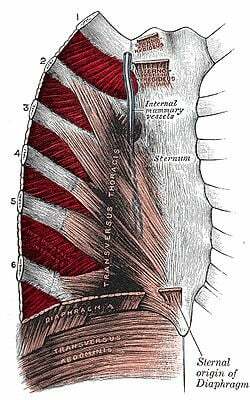 The intercostal muscles are considered accessory breathing muscles and the diaphragm is considered the major muscle of breathing. The contraction of the lungs during expiration is possible because the muscular diaphragm and the muscles between the ribs, which are referred to as intercostal muscles and shown in the pictures below, relax, thus allowing the lungs to contract and decrease in size so that the person is able to rid air and carbon dioxide from the respiratory tract during expiration. The lungs do not expand and contract without these muscles because the lungs to not have the muscular tissue to expand and contract. Normally, adults breathe 16 to 20 times per minute or from 960 to 1,200 times per hour. A respiratory rate of less than 16 per minute is referred to as bradypnea or slow breathing and a respiratory rate of more than 20 per minute for an adult is referred to as tachypnea or rapid breathing. Of all the vital signs, which include the cardiac pulse rate, the body temperature, the blood pressure and the respiratory rate, it is the respiratory rate that is the only vital sign that is able to be controlled with a conscious and voluntary effort. The other vital signs are involuntary and not controllable with conscious effort. Many disorders and disease can adversely affect the respiratory system and respiratory functioning. Some of these disorders can be congenital and others can be acquired. Congenital respiratory disorders affect the infant in the uterus before they are born. For example, a neonate, or newborn, can be born with hyaline membrane disease or cystic fibrosis.